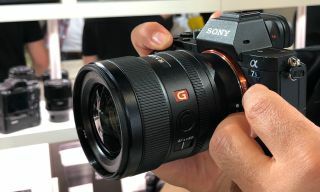 Sony has added a 24mm f/1.4 wide-angle prime to its G Master series of lenses, designed for its A7 and A9 full-frame mirrorless cameras. This latest Sony prime takes the total number of E-mount lenses to 48. With a fast maximum aperture of f/1.4, the Sony FE 24mm F1.4 GM weighs in at 445g, and measures 75.4 x 92.4mm – making it significantly smaller than some rivals. Sony claims that the size makes it suitable on its crop-factor cameras, such as the Sony a6500. The lens, which has a model number SEL24F14GM, has been designed with 13 optical elements in 10 groups, and features two XA (extreme aspherical) elements plus three ED (Extra-low Dispersion) elements. A Nano coating has been applied to minimise ghosting and flare. The diaphragm offers 11 aperture blades, which should provide great bokeh even when stopped down. It has a 67mm front filter thread, and comes supplied with a lens hood. Minimum focus of the lens is 0.24m, and has a maximum magnification of 0.17x. An aperture ring allows direct aperture control whilst an aperture click switch makes it possible to enable or disable click stops as required. The focus ring features Linear Response MF for fine manual focus control, "giving the user the control immediacy needed for fast, accurate manual focusing". The focus hold button is customisable and a focus mode switch makes it possible to quickly select auto or manual focus to match changing shooting conditions. With Canon , Nikon, Panasonic and Sigma releasing their own full-frame mirrorless camera, there is increased pressure in Sony having the fullest range of lenses available for its CSC range. The first E-mount Sony lens was first released in 2010, with the first full-frame camera being unveiled three years later in 2013. The Sony FE 24mm F1.4 GM is due to go on sale in October, with a recommended retail price of £1,450. We're hoping to see the new lenses at Photokina 2018.